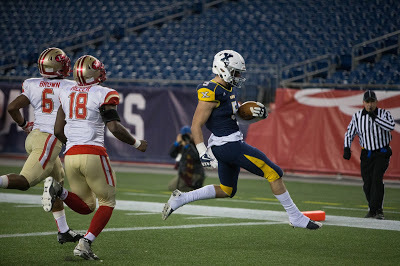 Mike Saliba has been a major part of Xaverian's early season success on both sides of the ball. With just about seven weeks gone by since the start of camp, we have reached the midway point of the 2018 MIAA Football Season. That being said, SuiteSports is excited to announce our 2018 Mid-Season All-State Team as selected by its panel of writers, correspondents, and editors. It's important to note that this is simply a mid-season team, and that players have plenty of time to work their way onto this list by the time we announce our 2018 All-State Team following the conclusion of the eight Super Bowls at Gillette Stadium in early December. We will have three instead of two teams when we release our final All-State team. Additionally, since this is built off a relatively small sample size (five, or maybe even four games) there's a chance that players who may be expected to make this list are omitted due to injury for a week or two that impacted overall production. Its safe to assume that those players, as long as they stay healthy, will be under strong consideration to appear once the season comes to a close. Lastly, while we always encourage conversation or input in our comments section, that space is not to be used to denigrate any players. This is not an easy selection, and unfortunately we only have so many spots to fill. The kicker/punter from Milford. We will be watching him on Sunday’s. Take a look. A site to see.